- Who uses eResearch Tools and Resources? eResearch refers to the use of advanced information and communication technologies (ICTs) to support research. eResearch aims to ensure research processes are more effective, efficient and collaborative. Data management entails the collection, storage and classification of research data to enable logical and timely data retrieval and management as well as sharing and reuse for researchers. It is very important that all research publications, including theses are supported by data-sets that can be used to prove the integrity of the research. Whatever the field and whatever level of privacy is needed for the data, having a plan to manage data for the long term is an essential part of research. 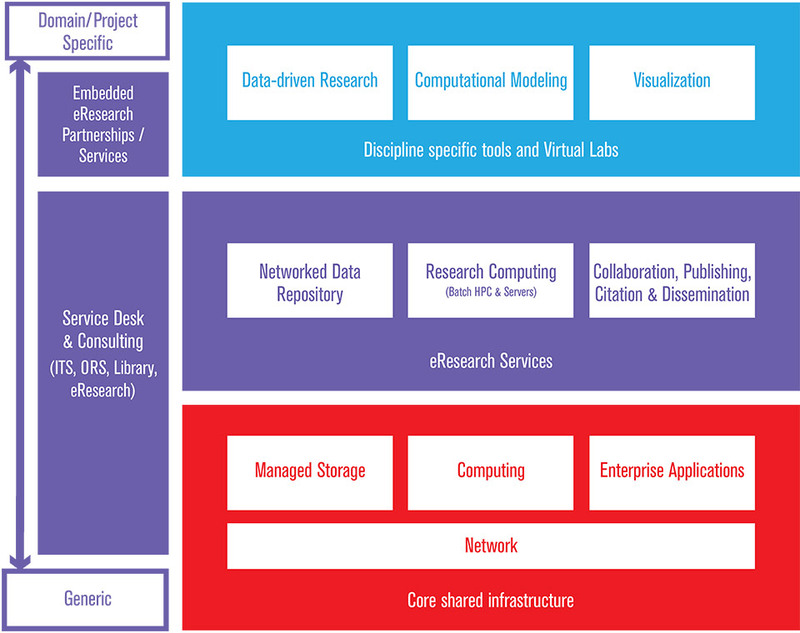 Via the sharing of robust infrastructure and high performance computing systems, eResearch facilitates the processes of data management, analysis and reporting across large and complex data sets. It also increases researchers' access to such things as advanced data processing and modelling techniques that would otherwise remain largely inaccessible to smaller institutions and individual researchers due to the costly nature of such systems. Global and interdisciplinary research collaboration enabled through communication and data sharing capabilities allows researchers to collaborate in real-time through technologies such as video conferencing and other web communication tools. These deliver improved research outcomes by enabling collaborative work data sets by providing shared access to storage and computing resources. eResearch is here to support research and its processes via the use of information and communication technologies. These ITCs offer to facilitate research development and innovation across both geography and research disciplines. 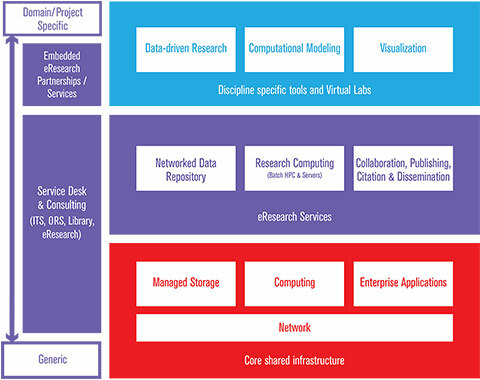 Below is a diagram that attempts to map-out eResearch. Reading from the bottom to the top the idea is that there are some basic eResearch enablers that need to be in place. The Australian Government has recognised this and is funding the development of national infrastructure. However, each institution obviously needs to ensure that is has some infrastructure of its own. The organisation needs to know about who's doing what. It's well understood that a lot of eResearch services are not generic, so that's the top cloud, where effective eResearch help needs to be a partnership between researchers and tech-specialists (sometimes they're the same people).